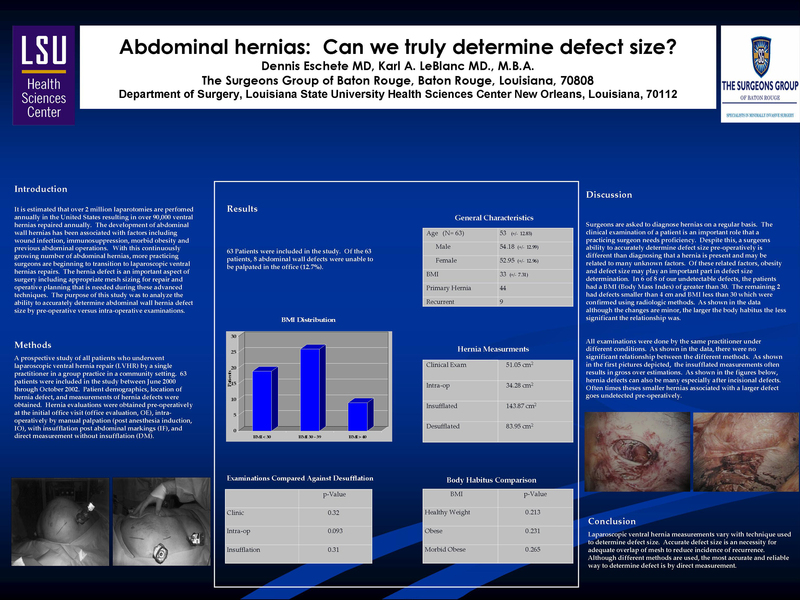 Abdominal Hernias: Can We Determine Defect Size? Introduction: To analyze ability to accurately determine abdominal wall hernia defect size by pre-operative versus intra-operative examinations. With the continuous growing number of abdominal hernias, more practicing surgeons are beginning to practice laparoscopic repair. The hernia defect is an important aspect of the surgery including mesh sizing for repair and operative planning that is needed during these advanced techniques. Methods: A prospective study of all patients who underwent laparoscopic ventral hernia repair (LVHR) by a single practitioner in a group practice within a community setting. 63 patients were included in the study between June 2000 through October 2002. Patient demographics, location of hernia defect, and measurements of hernia defects were obtained. Hernia evaluations were obtained pre-operatively (office evaluation, OE), intra-operatively (post anesthesia induction, IO), with insufflation post abdominal markings (IF), and direct measurement (DM). Results: Sixty three patients were included in the study with an average age of 53 years old. The average BMI was 33 with 44 primary hernia defects. Average defect sizes for OE, IO, IF and DM measurements averaged 51.05 cm2, 34.28 cm2, 143.87 cm2 and 83.95 cm2 respectively. Of the 63 patients, 8 defects were unable to be appreciated in office (12.7%) with an average of 51.05 cm2 in dimension. When compared against the direct measurement, the OE, IO and IF did not reach statistical significance with p-values of 0.32, 0.093, and 0.31 respectively. There also was no significance found in relation to normal, obese or morbidly obese patients in relation to clinical examination with p-values of 0.213, 0.231 and 0.265 respectively. Conclusion: LVHR measurements on patient populations vary with technique and the most accurate and reliable way to determine defect is by direct measurement.